Science fiction, double-feature …. sorry, that was another life. I used to groom for and ride a friend’s hyper-kinetic little mare [pictured here]. In order to maintain a vestige of control, she went in a figure-8 noseband over fences. She’d get hysterically excited before a cross-country trip or a jumping round, but the only way left to express her opinion was to waive her upper and lower lips. She was prehensile. We used to call her “rubber lips”. Rodney, OTOH, has loose lips. Rodney also takes himself and the world entirely too seriously. To counteract that, I fuss with him. The cowpox of irritation to inoculate against the smallpox of catastrophic events. He likes to stick his nose into my business. So I grab his upper lip, wave it about, or give it a raspberry. At first, he thought it was weird. Now, he thinks it’s weird but harmless. Mathilda, on the gripping hand, does not let you grab her lip. If you do chance to get purchase, she will stiffen it to the point that there is nothing left to hold. It’s not tension. It’s more that she will not allow you to take liberties with her person. 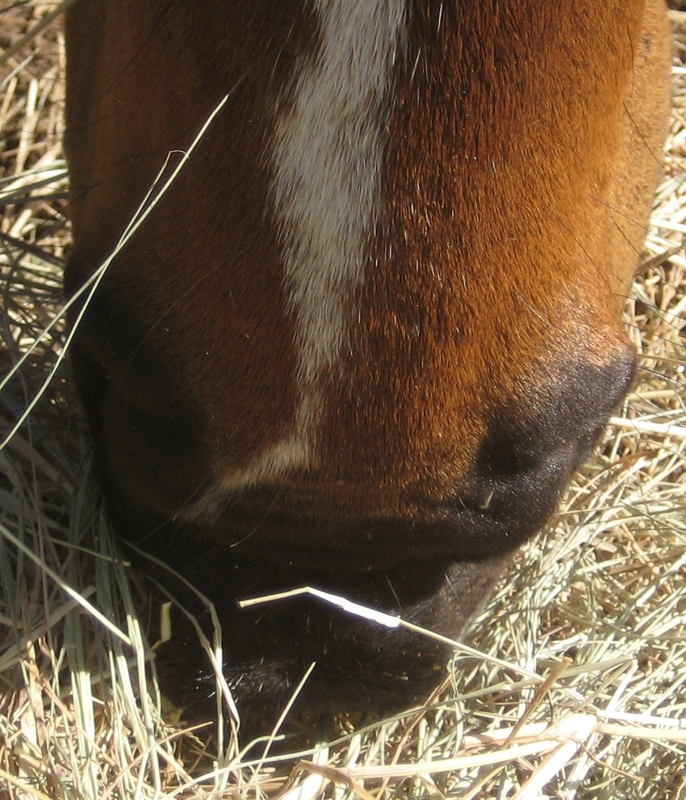 What manner of snoot behavior does your horse have? I didn’t have a camera, so I will try to paint a mental picture. I am lying in bed, head propped on pillows, iPad propped on chest. Room is otherwise dark. Kitten #1 comes along & drapes himself along my neck and shoulders. Kitten #2 comes up and lies down along my rib cage. Then, Kitten #3 joins us. Finding no room, he stretches out between the other two. In trying to sort out the pile of legs by feel, I realize that he has lain down directly on top of Kitten #1’s head. I looked like the guy in the Hanes commercial wearing a kitten shirt.